We would like to invite you to consider this opportunity for you to share your research with wider audiences. Impact and community engagement are what we are encouraged to consider more and more as academics at Deakin… participating in this project will do both for you. We invite researchers (at any stage) to join us as we present a public symposium about Integrative Ecology. The symposium date is the 11th April at Deakin Downtown. There will be 5 research presentations across the morning session. Then the public part of the day concludes and lunch will be served to you and the teachers who have offered to stay the full day to continue working. This work will involve designing and developing teaching and learning sequences for lower secondary science students (years 7 – 10). We hope that you will stay for the afternoon session to support this process. Some photos or video of this process would be great (especially if taken in the field) – this will be used to craft video resources to add engagement and interest to the resulting teaching and learning materials. One or two research papers – if you are published in this area. We would like to design student activities that have them engaging in published science. One or two media articles – if you have any. This will scaffold students to make accurate judgements about media presentations of science. Some data, if possible… as teachers often find it very hard to access good quality data so they can scaffold student development in learning how to analyse real (secondary) data. We will also need you to review the final web-based materials once they are generated – towards the end of May. The process has been designed to be thorough – but not time consuming or onerous for you. If you would like to be part of this initiative and raise your project’s profile, can you please send an EOI to Peta White by Friday 1st March 2019? The Centre continues to aim to strengthen its research collaboration and provide forum for our academics, researchers and our students to discuss and exchange research ideas. It is a great platform for our students to showcase their outstanding research. The conference will consist primarily of 5-minute speed talks, with a single plenary (our CIE seminar speaker for the week), and time for networking and catching up with your colleagues and peers. Lunch will be provided. Please register your interest at https://www.eventbrite.com.au/e/centre-for-integrative-ecology-cie-conference-2018-registration-35067117693 and submit a title (on-line) for your presentation by 1st September 2018. All are invited and encouraged to participate and attend, but we will give priority to students and postdocs to present if places are limited. All students attending should present a short talk. Invited speaker: Dr Hamish Campbell, School of Environment, Charles Darwin University. Best Student Talk will be announced at the closure of the conference. Best Student Paper Award will be conferred at the conference (in order to qualify for theaward, the paper must be nominated and sent by your supervisor, directly to Tim Jessop, email tim.jessop@deakin.edu.au. More details on this will be sent by Tim. Full details of the program will be made available closer to the date of the conference. Your attendance is important to the success of the conference. If you are able to join us for this event, please register by 1st September at the above link. Honorary Research Fellow, Centre for Policy Futures, Faculty of Humanities and Social Sciences, University of Queensland. LOCATION: Melbourne Campus at Burwood –Burwood Corporate Centre. For external guests, you can connect as a web guest by clicking HERE. If using Chrome you it will prompt you to install the Cisco Jaba Plugin, then it will prompt you to download the extension which you will need to install. Once this has been installed, you will have a black screen with a call button. You will just need to click call and it should connect into the VMP. For Deakin staff and students, please join via Skype for Business (Lync) – if you have office installed you may already have Skype for business or Lync installed. You just need to look for it on the start menu. If you find it, you can log into skype using your Deakin email and password and then dial 36958. Could not log in? More info on how to connect is available HERE or HERE. ABSTRACT. Translating policy into environmental outcomes is typically a messy and difficult process, regardless of the issue at hand or the location of concern. Existing policy systems are political and value-laden, and involve multiple actors with a range of motivations and interests. This means that scientific evidence tends not to feed into policy and practice in a neat, linear fashion, making this process challenging and often frustrating for researchers to navigate. An interdisciplinary lens, which combines public policy, environmental law, economics, and other social and natural sciences, can facilitate our understanding and engagement with complex policy processes. In this seminar, I will describe my work to date on biodiversity offsetting and carbon farming, with a focus on how these policies are interpreted and applied in practice. I will also discuss the university sector’s current focus on impact and engagement, and how scientists (and especially early career researchers) can effectively navigate policy processes to create their own pathways to “impact”. Finally, I will provide a short overview of the Queensland Government’s $500 million Land Restoration Fund. BIO. Megan is Principal Scientist in the Project Management Office – Land Restoration Fund, Department of Environment and Science, Queensland Government, and an Honorary Research Fellow in the Centre for Policy Futures at the University of Queensland. Her research falls broadly within environmental policy, governance and economics, with a particular focus on how complex policy processes translate into environmental outcomes. Megan is passionate about conducting interdisciplinary, impactful research in close consultation with colleagues working in government, non-government organisations and industry. 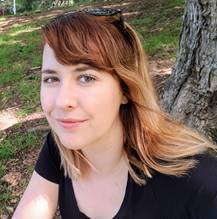 She is a handling editor for Conservation Letters and Conservation Biology, and recipient of the 2018 UQ Faculty of Science Rising Star Award. PhD top-up scholarship: How are reptiles affected by the interaction of invasive predators and bushfires? The PhD scholar will initiate and conduct research in reptile ecology with a focus on how reptile species and communities are affected by the interactions between invasive predators (foxes and feral cats) and fire. The project is part of an ARC-funded Linkage grant which, in collaboration with the Victorian Government and the University of Melbourne is investigating the effects of landscape scale fox control across replicated forest areas in south-western Victoria. Planned burns in these regions provide the opportunity to measure whether fox control affects reptile responses to fire. Another exciting aspect that this PhD project will be to discover whether predator impacts can be mitigated using constructed shelters in recently burnt environments. This three-year top-up scholarship is funded by the Australian Research Council Linkage project scheme in a project led by University of Melbourne. The project comes with additional funding to cover research costs and conference participation. The project includes a vibrant supervisory team, including Professor Don Driscoll, Dr Tim Doherty, and Dr Bron Hradsky. The successful applicant for the top-up will need to apply for a full PhD scholarship in the Faculty of Science, Engineering and the Built Environment, Deakin University shortly after notification of the outcome. ABSTRACT.Conservationists usually lack critical information about what actions need to be taken most urgently to protect threatened species, and where these actions should be implemented. This problem is worst for species that occur over large areas of potential habitat, have small populations, or are difficult to detect. Unfortunately, most critically endangered Australian birds have one or more of these traits, and despite substantial public concern for their plight, populations of these most ‘difficult birds’ continue to decline. The Difficult Bird Research Group at ANU takes a fresh look at species considered too challenging to effectively study or protect. I present case studies that use Australia’s most endangered bird species to illustrate how conservation paralysis and lack of knowledge can be overcome by using science creatively. Our research programs on orange-bellied parrots, regent honeyeaters and swift parrots demonstrate that by using innovative and adaptive approaches, it is possible to take ambitious conservation risks that can pay-off, even for difficult species. BIO. I am a conservation scientist interested in the factors that affect small and declining populations, and am the lead post doc of the Difficult Bird Research Group. 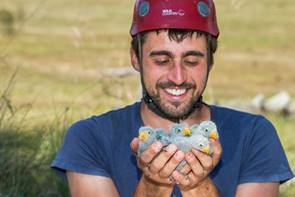 I undertook my PhD research on the breeding biology of the endangered swift parrot in their Tasmanian breeding range, and it was this research that led to the discovery of the severe predation on birds by sugar gliders. My research was the first to apply new technology and analytical tools to address a major gap in knowledge about one of Australia’s most threatened birds. I also work on orange-bellied parrots, and supervise students working on regent honeyeaters, forty-spotted pardalotes, masked owls and ground parrots. I specialise on species traditionally considered difficult to study and conserve, and I aim to identify new approaches to overcome barriers to effective conservation. 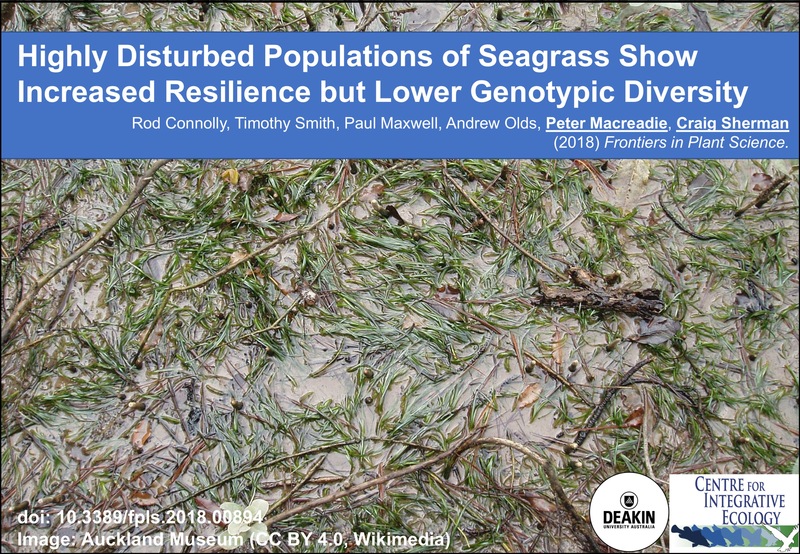 Highly Disturbed Populations of Seagrass Show Increased Resilience but Lower Genotypic Diversity. 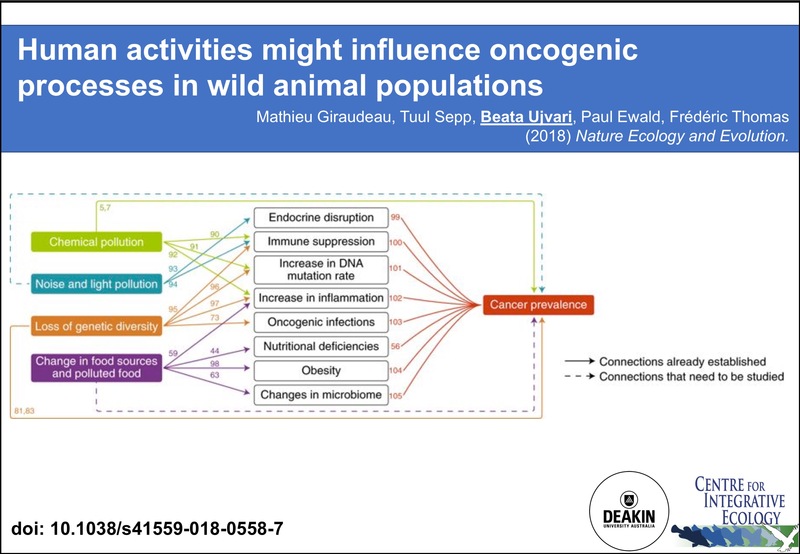 Human activities might influence oncogenic processes in wild animal populations. 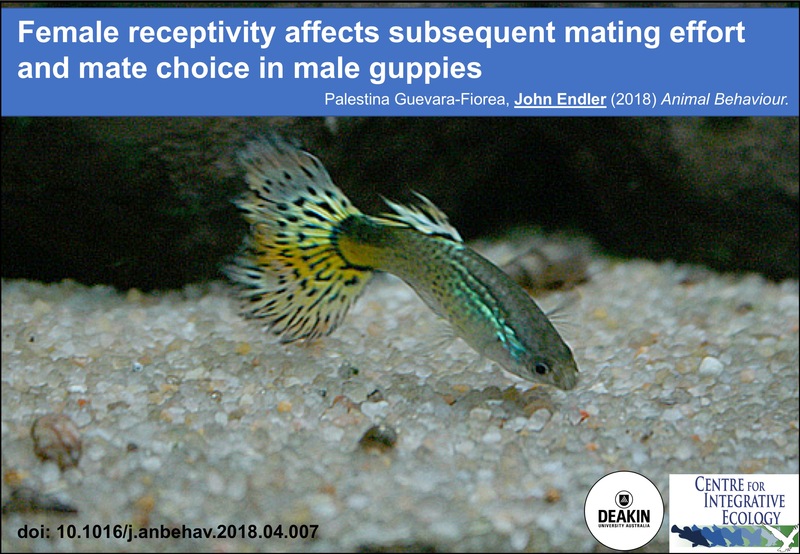 See the paper at Nature Ecology and Evolution. 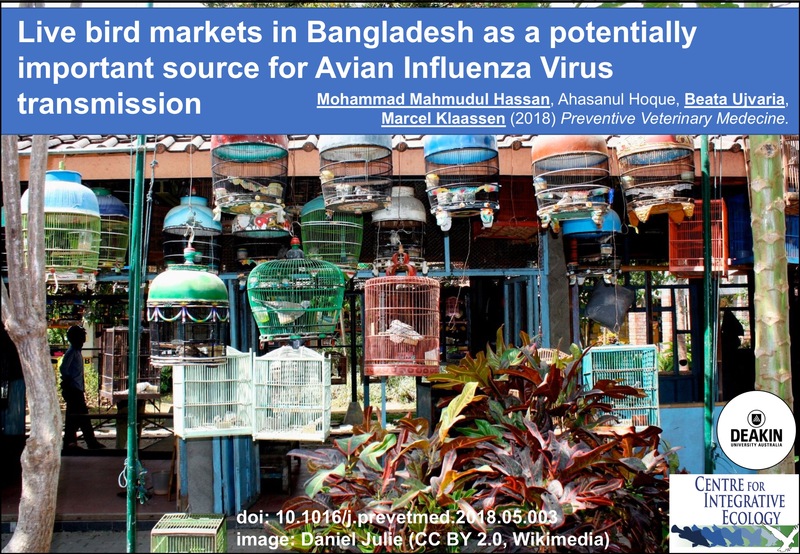 Live bird markets in Bangladesh as a potentially important source for Avian Influenza Virus transmission. See the paper at Preventive Veterinary Medicine. 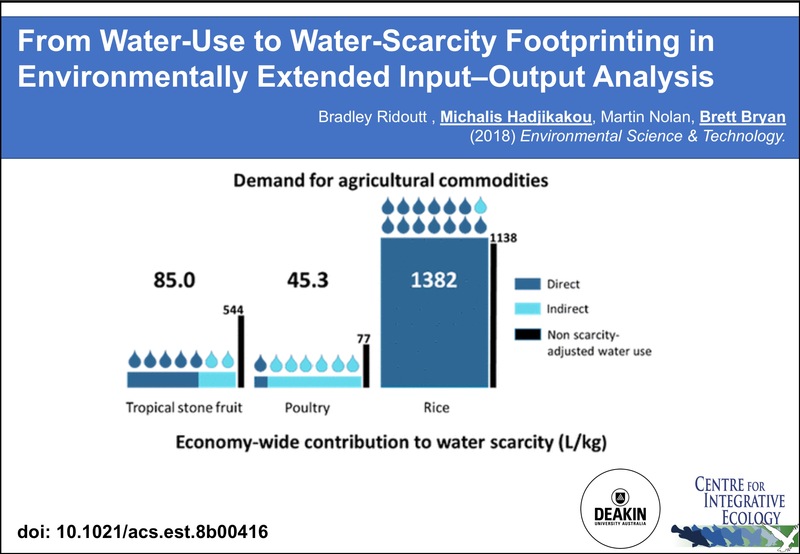 From Water-Use to Water-Scarcity Footprinting in Environmentally Extended Input-Output Analysis. See the paper at Environmental Science & Technology.